Still no first name for Llewellyn? Now that man knows how to keep a secret. It’s a ‘zen’ first name. He has a first name by not having one. His first name has been stated several times. It’s really long. I’ve just kind of assumed that dragons get their first names post-mortem. So that their names reflect the life they lived. That way they can always say the names of their ancestors were fitting. It is a dragon conspiracy to make mammals wondee how dragons are ao apt at naming their kin. Wait, so technically Ms. Mudd is also a “Millie”? 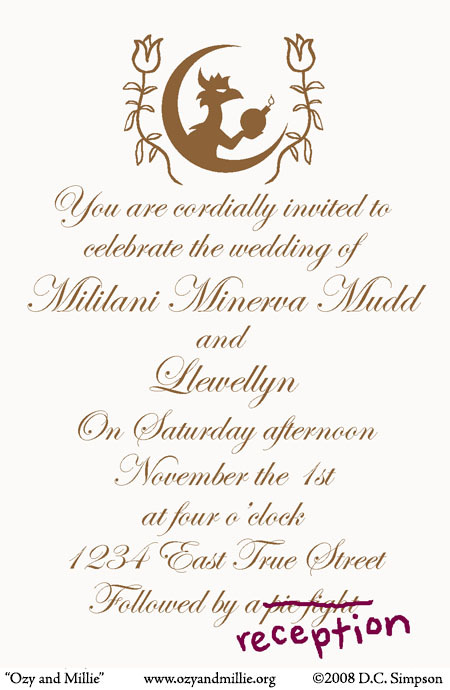 Ms. Mudd’s first name is Mililani. Anybody else noticed that the dragon symbol at the top is holding on to a bomb? Ah. So here it is… the beginning of the end. They’re getting married on my birthday! Yay! An address like that will instantly get a phone scammer to hang up on you. I don’t know if i’d go or not… I was looking forward to the pie fight. Judging from the graphic on top, Millie will fit right into her new family.